So after an eventful Christmas and New year I’m still trying to get through the huge amount of prawns Ive got in the freezer. 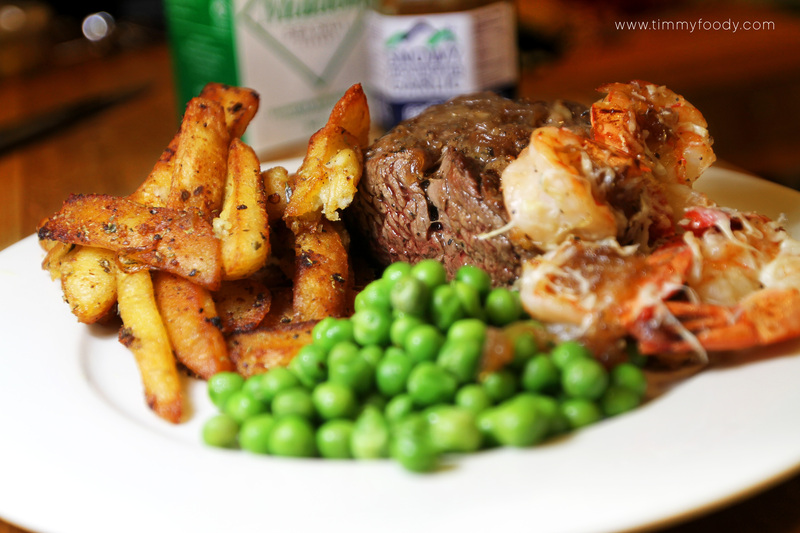 I also had a nice bit of eye fillet so it was all pointing towards a bit of surf and turf. Now I still have some of this really nice Garlic Relish that I got from Snowy Mountains Garlic. 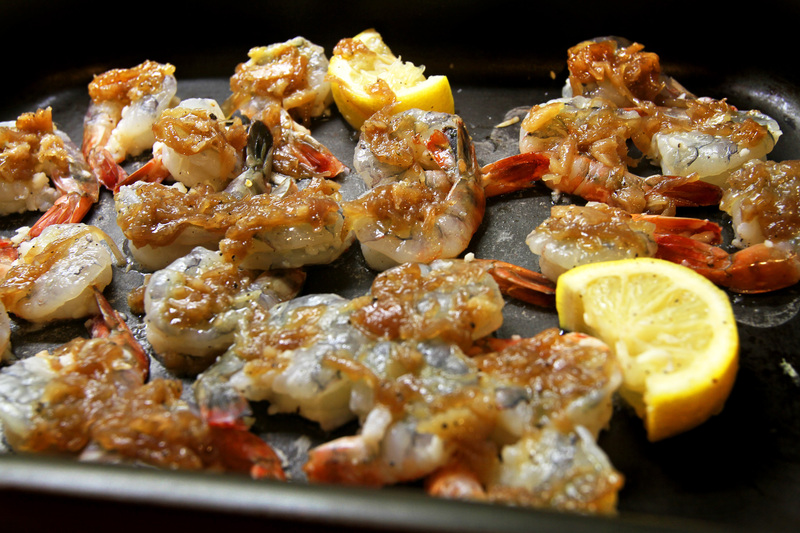 I had an idea to do some oven roasted garlic prawns and use this relish in some way. So here’s what I did. Any kind of large prawns. I’m using Tiger prawns – about 500 grams. Slice the back of them part way through so they butterfly out when the cook. 2 Cloves of Garlic finely smashed up and finely chopped. 1. ok so smash up and finely chop the garlic. Add this to the prawns, the juice from 1 lemon and a pinch of salt and pepper. Add a bit of red chilli if you like a bit of spice. Mix well and put to one side. 2. Now turn your oven on to about 200°C, pop in a roasting tray to heat up. While this is heating up get the garlic relish and spoon some on a plate, add a dash of olive oil and smush up the relish a bit. Once the tray has heated up add the prawns, then add the relish spooned on top of each prawn then pop in the oven for about 6-7 mins. 3. 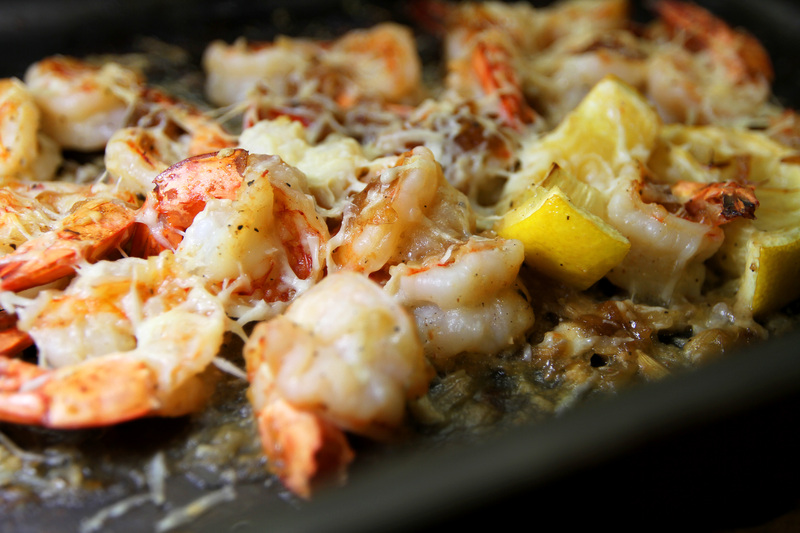 Now remove the prawns from the oven turn the grill on and add a the garlic relish on top of the prawns then grate some pecorino cheese on top and pop under the grill. Give this another 6-7 mins so the cheese melts and goes a bit golden. 5. remove from the oven and there we go! Great as a snack or finger food at a party. Alternatively great for lunch with a nice mixed salad. 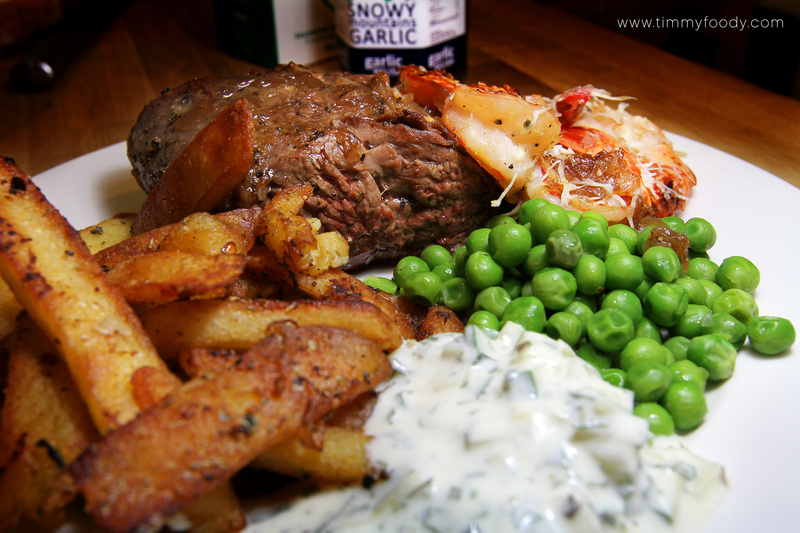 Now, because I had this nice bit of Fillet steak I decided to do a nice bit of surf and turf. I wanted to do some of my nice potato wedges but I’d ran out of potatoes! Luckily my housemates had some oven chips in the freezer so I nicked these then popped them in the oven, adding a dash of olive oil, salt and pepper, some mixed herbs and a few smashed up cloves of garlic. 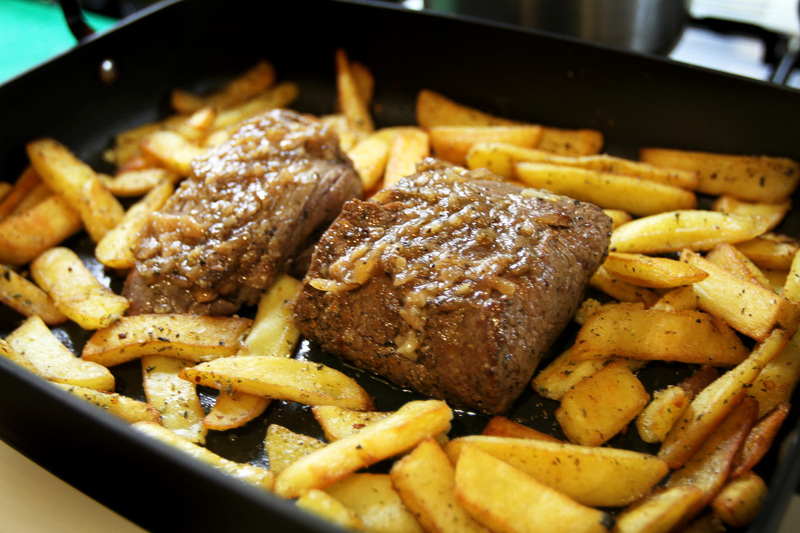 Oven chips are pretty boring so it’s always good to think about ways you can improve things like this. While this was cooking I started on the eye fillet. 1. So all I did was take the eye fillet, drizzle with olive oil then add salt and pepper. I got my pan nice and hot and seared the fillet on all sides. Literally 30 seconds on each side. Important: Make sure the pan is smoking hot before you add the steak. 2. Once you’ve sealed this on all sides add to the oven. As I had a bit of the garlic relish let over I spread this over the eye fillet before I put it in the oven, I added it to the pan I was cooking the chips in. 3. At this point if you want to do the prawns add them to the oven now. Give the fillet about 6 mins in the oven. This will make it rare. If you want it medium give it about 8-10 mins. If you want it well done then stop reading right now and slap yourself in the face. 4. After 6 mins I removed the fillet to allow to rest for a further 6-7 mins. Remove the prawns at this point as well, add the cheese then pop under the grill. While the fillet is resting I tossed the chips around a bit to mix up all the steak juices and gave them another 5-6 mins in the oven, just to get them nice and crispy. Now remove the prawns from the grill and the chips from the oven. Sorted. I served this with some nice peas and some of my home-made tzatziki on the side that I had left over from a few days ago, great for dipping the chips into! Proper comfort food for me! Give those prawns a try. Super easy and really tasty.